Sandy's Pearrls: HAPPY 2ND BIRTHDAY GRANT!!!! We all celebrated Grant’s 2nd birthday on Saturday, February 12. He has grown into such a big boy and is so sweet. His favorite things (at 2 years old) are playing outside, playing inside, okay, just playing anywhere. He is always excited when Luke, Rylee, and Parker are around and he wears himself out playing with them. He and Parker are about the same size and have had a couple of tiffs that almost came to blows! It’s kind of funny to watch them to see who gets the upper hand. At 2 he weighs almost 30 pounds (just a couple of ounces shy of 30) and is tall for his age. He is starting to talk and is very particular about most things. If he doesn’t want to change clothes then he just doesn’t. Don’t even try! He doesn’t care if they are dirty or wet. He probably likes what he is wearing. The “twos” are upon us and we love him just the same. And for more great news. Grant is going to be a big brother to a LITTLE SISTER! I am thrilled that I will be having another granddaughter (and so is Rylee). 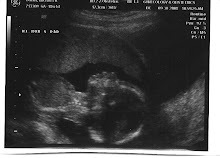 She should be here around the first of July and her name will be Reese Gentry Oguin. We can’t wait to meet her!